Tehran & Moscow: pals or partners of convenience? 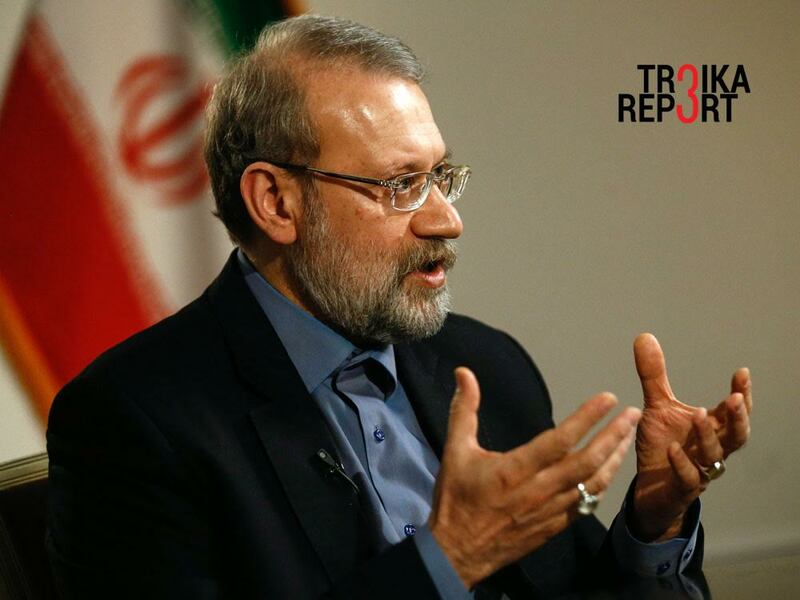 Ali Larijani, the speaker of the Majlis (Parliament) of Iran. Relations between Iran and Russia have always been prone to suspicion, speculation and prejudice. Now that the two nations claim a vibrant on-going political dialogue, does it mean a genuine rapprochement between them, with elements of “friendly relations”, as Russia’s presidential press secretary called it? Moscow-based analysts are reserved but reasonably hopeful. The amount of upbeat rhetoric by politicians on the state of play and prospects of Iranian-Russian interoperability is sometimes reminiscent of spells of rain. The sheer volume of goodwill condensed in these optimistic prophecies mesmerizes. Iran’s ambassador to Russia, Mehdi Sanaei, declared last November that a “new chapter” in bilateral relations has been opened. The conclusion was backed by reference to the diplomatic support rendered by Moscow to Tehran in helping to strike a balanced nuclear deal with the West, the $5 billion credit line to boost trade, and operational coordination of military actions in Syria. In the wake of Larijani’s visit, Iranian Defence Minister Hossein Dehghan arrived to Moscow to take part in the International Security Conference, supporting the assumption that the brass hats of both countries keep all channels open, and it works. Nevertheless, the compatibility of long-term strategies of both countries is being put to test on a daily basis. Several recent developments are bringing the two countries on either a collision course (the worst scenario) or simply slowing down or even freezing the current pace of cooperation (the best scenario). Iran’s uncooperative stance on the idea of freezing oil production at mid-January levels, to rebalance the supply/demand equation and drive up prices has been one of the key factors that derailed the Doha pre-sealed agreement. The preliminary deal reached with a lot of effort by Russia, Saudi Arabia, Qatar, and Venezuela was supposed to be signed in Doha, but Iran’s opposition led Saudi Arabia to torpedo the move, which might have been the first step to set up a more effective alliance to regulate the global oil market, sort of an OPEC-2. Iranian Oil Minister Bijan Zanganeh was intransigent on a Doha accord and fully committed to the proclaimed goal to raise domestic oil production, and boost its hard currency revenues. Viewed in perspective, the imminent return of Iran as a major exporter of hydrocarbons, be it oil or pipeline gas or LNG, would increase overall supply, put downward pressure on prices, and, in theory, enhance competition by challenging Russia, for instance, in its traditional European oil markets. Cooperation in the energy sector and, consequently, economic ties between Russia and Iran might slip on this oily banana peel. In March, it also came to pass that “Iran is impeding implementation of contracts with Russia on construction of a thermal power plant in Bandar Abbas and railway electrification by setting new price conditions”, Russian news agency TASS reported. Nothing really big and similar to Bushehr NPP project is in the pipeline for the moment. Also, there does not appear to be any willingness on the part of Tehran to reward Moscow for mediation with the West on the nuclear dossier and for propping up Assad’s regime in Syria by rolling out the red carpet of preferential treatment in trade and economic cooperation. Was it mere wishful thinking? Do misplaced expectations cool off the enthusiasm and perspectives of a surge in economic interaction? Would Russian business be welcomed as a “newcomer”? There have been rumours that Tehran does not exclude joining the Russia-led Customs Union. Is this a fact? Moscow duly consulted Tehran before launching airstrikes against Islamic State (IS) militants in Syria, after being formally invited by the legitimate regime in Damascus. The Iranian military were briefed on the launching of Calibre sea-launched missiles from Russian battleships in the Caspian Sea. Routine coordination of military activities has become standard procedure. Surprisingly for many, it worked well. This may look good, especially in reports, but it hides the divergence of geopolitical objectives pursued by Russia and Iran on Syria. Moscow wants to prove its point: foreign interventions in conflict zones and in convulsing states torn apart by civil war, carried out without mandate of the UN Security Council and without approval of legitimate governments, are unacceptable. Russia wants to stress that this is already a multi-polar world, and the interests of all nations, big or small, have to be respected. In this context, Moscow does not really care whether Bashar al-Assad remains President of Syria or is replaced by someone who would honour the principles of secularism, fight unrepentant jihadists, curtail the spread of radical Islam, and accept the presence of Russian naval and air force bases on its territory. Iran, on the contrary, has a stake in preserving the Alawite (Shiite) clan in power in Syria. The collapse of Assad’s regime might lead to the emergence of a Sunni-led government, sponsored and supported by Iran archrivals in the region, Saudi Arabia and Gulf monarchies. Tehran, therefore, takes into consideration Moscow’s diplomatic manoeuvres aimed at not alienating Sunni Arab states. Tehran also frowns with displeasure that Russia has established almost privileged relations with the State of Israel. It adds ambivalence to the alliance of convenience forged by Iran and Russia, since the latter is not keen to get involved in the formation of any Shiite Crescent. At the stage of finding a formula for intra-Syrian reconciliation, the disagreements over where is the “final destination” would almost certainly surface. (Editor’s note: The 1813 Gulistan Treaty and the 1828 Treaty of Turkmenchay sealed the expansion of Russia by conquering all Caucasian territories from Iran, comprising modern-day Dagestan, eastern Georgia, Azerbaijan, and Armenia. Persia ceded to Russia control of several areas in the South Caucasus: the Erevan Khanate, the Nakhchivan Khanate, and the remainder of the Talysh Khanate. The government of Iran was obliged not to prevent Armenians from moving to the Armenian region created in these khanates, which contributed to the unification of the Armenian people within the Russian Empire. Russia obtained the full right to navigate all of the Caspian Sea. Iran had to pay a compensation of 20 million rubles in silver, later decreased to 10 million rubles). Probably, the Soviet troops deployed in northern regions of Iran during World War II, to prevent the Nazi invasion, were also not welcome. The fundamental differences are evident, and give ground for doomsday predictions. “Despite their numerous anti-Western interests, Russia and Iran are not allies”, Mark N. Katz, professor of government and politics at George Mason University, said. The American professor appears to underestimate the voluntary decision by Iran to join the Shanghai Cooperation Organization (SCO), a Eurasian political, military and economic organization with China and Russia as the architects and locomotives. Do the demons of the past still haunt the present? Is it irrevocable? According to Lana Ravandi-Fadei, there never was a strong anti-Russian sentiment akin to hatred. The dominant feeling can be described as “distrust”, with a faint chance it now starts to fade.